Kathryn Matthews is a New York City-based Certified Integrative Nutrition Health Coach and a well-published food and health writer, whose work has appeared in many publications from The New York Times to O, The Oprah Magazine. A former restaurant reviewer and alum of The French Culinary Institute in Manhattan, she is passionate about yummy-tasting food—and a firm believer that cooking for yourself is a first step toward better health. Kathryn is also the founder of The Nourished Epicurean, a recipe-driven blog about healthy living. As a nutrition health coach, she helps clients improve their health—and increase their energy—through diet and lifestyle changes. Every year, around mid-March, I feel a sudden and intense shift in my food cravings. I’m like that woman, who, jonesing for her fix (a carton of rocky road ice cream, a super-sized bag of chips, or other wanton desire) finds herself driving to the nearest Seven-Eleven in her robe and bunny slippers. In my case, my cravings have me speed-walking (since I live in New York City) to the nearest Whole Foods Market, where I heed a primitive urge to “forage” through the produce section until I find asparagus and cilantro and to “spear” some wild-caught salmon from the fish case. During the spring, our bodies naturally want to detoxify and cleanse from the heaviness of winter (physically, emotionally and spiritually). Many cultures around the world practice some form of spring cleansing or fasting as a way to renew the body and spirit. Many traditional fasting practices—both eastern and western—typically reduce or eliminate animal proteins, fats and animal-based products (like dairy). While I’m not one to go completely meatless in any season, I notice that my desire for eating grass-fed meats shifts to mostly fish, especially wild-caught salmon, right around March. Salmon is appreciably lighter than meat, but on blustery, raw spring days—common here in the Northeast—its lush, fatty melt-in-your-mouth quality makes salmon my go-to comfort food. Spring is also a season when our palates are primed for astringent and bitter-tasting foods, like dandelion greens, arugula, cabbage and asparagus, which help cleanse the liver, the main organ responsible for eliminating toxins. Between March and June, I eat a lot of asparagus. One of my favorite spring dinners is simply roasted asparagus with cilantro-pumpkin seed pesto. It’s delicious, filling and satisfying. I’ve been known to chow down a pound (or more) of asparagus—especially roasted asparagus generously topped with cilantro pesto—in one sitting. I don’t believe in “counting calories” (and I never do), but, for the record, asparagus is a low-calorie, non-starchy vegetable. I prefer thin asparagus spears to fatter ones, finding them more tender and flavorful when cooked. As you’ll see below, preparing roasted asparagus is a cinch. 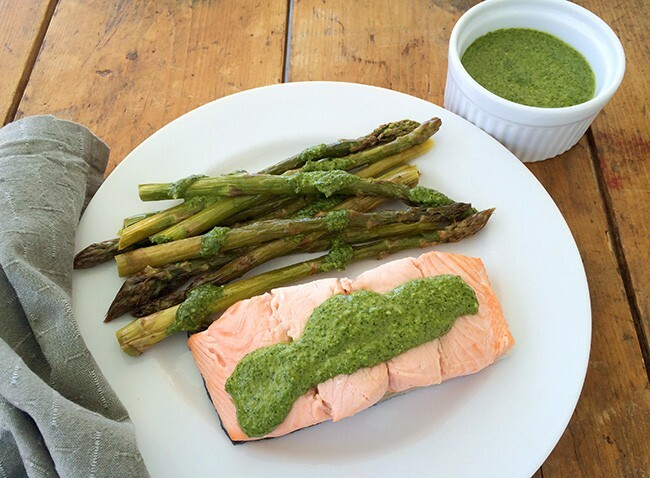 Asparagus with cilantro pesto makes a perfect meatless meal; both are also a wonderful complement to fish, like an easy-to-make poached salmon. Line a heavy-gauge cookie sheet or baking sheet with parchment paper. Arrange asparagus spears in an even layer on the sheet. Drizzle olive oil over the spears; gently roll asparagus and massage olive oil in with your hands. Place baking sheet on center rack and roast 15-20 minutes, depending on your oven and the thickness of the spears. Season with Celtic sea salt; top with cilantro-pumpkin seed pesto (below). Place the cilantro, pumpkin seeds, hemp seed, sea salt and lime juice in a food processor. With the processor running, drizzle in the olive oil through the funnel attachment. Process until the pesto is well-blended and smooth. In a 12-inch stainless skillet with 2 inch sides, add 4-5 cups of water. Cover. Bring water to a gentle boil over medium-high heat. Add salmon. Reduce heat to a simmer. Cover. Cook 4 to 6 minutes, depending on thickness of salmon. Transfer salmon to a plate or serving platter. Top with cilantro pesto and serve with roasted asparagus. Find more recipes and healthy tips from Kathryn on her blog The Nourished Epicurean.